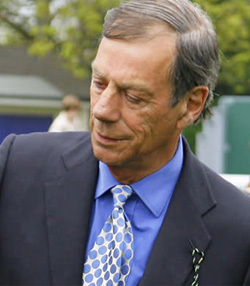 Sir Henry Cecil with Frankel. Legendary British horseracing trainer Sir Henry Cecil has died at the age of 70 following a long battle with stomach cancer. Cecil, who died on Tuesday morning, was champion trainer 10 times and had 25 British Classic winners. He was the master of Warren Place in Newmarket and had a record 75 successes at Royal Ascot. He revealed six years ago that he had been having treatment for for non-Hodgkin’s lymphoma. Knighted by the Queen in 2011, Cecil’s later years saw him fight cancer but were illuminated by the great Frankel, officially the best horse in the world and unbeaten in 14 starts before retirement at the end of last season. Frankel carried the colours of Cecil’s great patron Prince Khalid Abdullah, owner of Juddmonte Farms. Henry Richard Amherst Cecil was born on January 11, 1943, 10 minutes ahead of his twin brother, David. His father, Henry Cecil, younger brother of the 3rd Lord Amherst of Hackney, had been killed in action with the Parachute Regiment in North Africa a fortnight earlier. His mother, Rohays Cecil, was the daughter of Major-General Sir James Burnett of Leys, 13th Baronet, owner of Crathes Castle, Aberdeenshire. Sir Henry Cecil with Tom Queally and Frankel. When he was still a baby, Cecil’s mother married Captain Cecil Boyd-Rochfort, who was British flat racing Champion Trainer five times and who trained for, among others, King George VI. After school, the twins went to work at the Earl of Derby’s Woodland Stud in Newmarket, Suffolk, and at other studs overseas. They completed their education at the Royal Agricultural College, Cirencester. From 1964 to 1968 Cecil worked as an assistant at his stepfather’s Freemason Lodge stable. He took out his own licence to train in 1969 and that year had his first winner with Celestial Cloud at Ripon on 17 May, with Wolver Hollow winning the Eclipse Stakes in July to give Cecil his first Group One success. He had his first winner at Royal Ascot the following year when Parthenon won the Queen Alexandra Stakes. The languid, dandyish Cecil, noted for his flair in clothing, went on to remarkable achievements. In 1973 he tasted his first Classic success in Ireland when Cloonagh, bred by Cecil’s half-brother Arthur Boyd-Rochfort, won the Irish 1000 Guineas and in 1975 he won his first English Classic with Bolkonski at the 2,000 Guineas. He won three 1000 Guineas and a further 2000 Guineas before winning his first Epsom Derby in 1985 with Slip Anchor. Cecil, with his dapper Hermes ties, Gucci loafers and self-deprecating personality, with his head characteristically to one side when fielding the attention of the media in post-race interviews, attracted fervent support from the public and was a much-loved figure. He had a unique charm – he tended his obscure varieties of peas and roses in his garden with as much care as he did his horses, and collected lead soldiers. In 1976 he had taken over the running of Warren Place in Newmarket from Sir Noel Murless, the father of his first wife, Julie, and he turned the stables into what has been called “the most glamorous yard in Europe”. In 1999 he won three of the five Classic races and finished second in the other two. Prince Ahmed bin Salman, the owner of Oath, one of Cecil’s Derby winners, once said: “Winning Classics is easy. Just buy a horse and send it to Henry Cecil”. But after years of success, Cecil experienced a dramatic fall from grace. In the space of a few years several owner-breeders with long-standing relationships with Cecil died, including Louis Freedman, Jim Joel and Lord Howard de Walden. His first wife, Julie, and his head lad, Paddy Rudkin, left and in 1995 Cecil’s relationship with Sheikh Mohammed broke down, with the owner removing the 40 horses he had in training at Cecil’s stable. Sheikh Mohammed suggested at the time that he had not been informed about an injury to one of his thoroughbreds, although Cecil maintained that they were still “great friends” and had not fallen out. Cecil and his first wife, Julie, divorced in 1990. Cecil had been conducting an affair with Natalie Payne, whom he married two years later. When they met Cecil was 46 and his future second wife was 22. Cecil’s second marriage broke down very publicly, and they divorced in 2002. In 2008, Cecil married his third wife, his one-time secretary Jane McKeown. Lady Cecil has been granted a temporary training licence by the British Horseracing Authority, with runners declared for Newbury, Nottingham and Yarmouth on Thursday. There are currently more than 100 horses in training at Warren Place. “He had a great sense of humour. He was a super intelligent guy and really knew how to place his horses,” the 53-year-old said. Amy Starkey, regional director of The Jockey Club, said: “Everyone at Newmarket Racecourses is hugely saddened to hear the news that Sir Henry has passed away and our thoughts are very much with Lady Cecil and all of the family. “He was a much-loved gentleman of our sport and his winners were always hugely well received at both the Rowley Mile and the July Course. “Those of us at Newmarket Racecourses were lucky enough to regularly come into contact with Sir Henry and his kindness and willingness to help were greatly appreciated by us all. Only earlier this spring, he attended a meeting to offer his thoughts and advice regarding our race programme. Racing remembered Cecil with a minute’s silence before each of Tuesday’s four meetings, at Worcester, Fontwell, Lingfield and Salisbury, and jockeys at all four meetings wore black armbands as a mark of respect. Sir Henry Cecil is survived by two children, Katie and Noel, from his first marriage, and son Jake from his second marriage. Cecil’s twin brother, David, died from cancer in 2000.